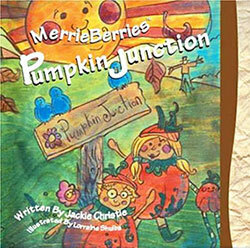 Pumpkin Junction is about a country picnic celebrating the harvest featuring the first three MerrieBerrie™ characters created and written by Jackie Christie. The characters include three pumpkin children, namely, Brother Hunkin (oldest), Brother Dunkin (middle), and baby sister Bunnykin with her pumpkin dollie, Dollie-kin. The paintings that comprise the illustrations for the book are beautifully hand-painted in true harvest colours by local Edmonton artist Lorraine Shulba. 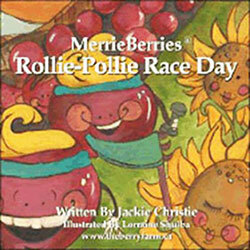 Rollie-Pollie Race Day was created and written by Jackie Christie, writing in a sing-song-ey poetry format, and introduces more new MerrieBerrie™ characters. These are “The Cherry Racers” that speed-roll themselves along the race course, Rollie-Pollie style. A cartoon map of the race is included which takes place on the author Jackie, and her husband Jim’s berry farm. The race starts off with a bang (whistle) by race judge, Sergeant Sam Saskatoon-berrie, with exciting play-by-play race action through Lone Pine Point, Hazelnut Hill, Raspberry Ridge, and Gooseybird Marsh. The paintings that comprise the illustrations for the book are beautifully hand-painted in bright cherry-hued colours by local Edmonton artist Lorraine Shulba. 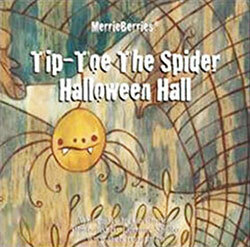 Tip-Toe the Spider was created and written by Jackie Christie, writing in a sing-song-ey poetry format, and introduces yet more lovable and new MerrieBerrie™ characters attending a children’s dress-up Halloween party at a local county community hall. This is based on a real historical building located across the road from Jackie and her husband Jim’s berry farm known as Colchester Hall of Strathcona County in Alberta, Canada. The party starts off with a spooky spider theme and introduces the master of ceremonies and judge, a delightful – not scary – Tip-Toe, the Dancing Spider, and his singing sister, Arachnia (also means spider). The fun includes a skeleton cake, little graveyard cupcakes, and finishes with a lovable costume contest featuring cheerful children dressed as bumble bees, animals, fake fang-ey Count Draculas, and beautiful princesses. The paintings that comprise the illustrations for the book are beautifully hand-painted in spooky gray Halloween tones by local Edmonton artist Lorraine Shulba. 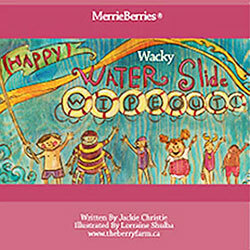 Wanda Watermelon’s Wacky Waterslide Wipeout was created and written by Jackie Christie, writing in a sing-song-ey poetry format. It introduces more lovable and new MerrieBerrie™ characters on a field trip from the MerrieBerrie™ school to the “Wild Waterslide Pool”. This latest book introduces Wanda Watermelon featuring previous MerrieBerrie™ characters, such as Tip-Toe the Spider. The day starts off with a school bus ride, arriving at the waterslide. The lifeguards start with pool safety rules and the story continues with dazzling and fun waterslide rides through tunnels, and slides and kids racing to the bottom of the pools. Having too much fun with all the cookies and treats, the kids learn loop-de-loops and then don’t want to “leave and go home.” With a happy surprise ending, Wanda and her friends start the ride home – until next time. The paintings that comprise the illustrations for the book are beautifully hand-painted in “little kids” style by local Edmonton artist Lorraine Shulba.